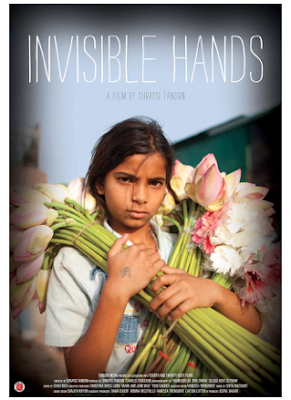 Spanning the globe INVISIBLE HANDS shows us the cost of employing children as workers. Many are essentially slaves having been trafficked into becoming abused and poorly paid worker. Others have been sent by their parents who need the money they can earn. No matter how they end up in the work place the kid’s lives are altered almost always for the worse, thanks to the abuse hurled at them and the dangerous conditions they work in. What most people don’t realize is just how many products either do or potentially do employ child workers in their manufacture. One of the examples they use is the listing of items with palm oil. It’s used in everything. So many products are named that you’ll be shocked that something you use could be the result of child labor. We see the products. One of the strengths of the film is that it doesn’t shy away from naming names. Dow Chemicals is mentioned as a source of danger since often the insecticides and herbicides it manufactures but can’t sell in developed countries which are used in places with no regulation thus posing a poisoning danger to the kids who use them. Apple’s checkered history is mentioned, as is their change in corporate policy which now requires those companies caught using child labor to pay their salary until they are old enough to legally work. And Nike is singled out as being one of the good companies, taking steps to assure no children are used and safe work places. While there are times the film can seem by the book in its telling, the sheer weight of the facts overwhelms any concerns and leaves one rocked at the end.